M&M Lighting is no stranger to wall sconces, and we understand the value this type of lighting solution brings to your home or office. If you need more light in your bathroom, bedroom, family room or basement, you may want to consider purchasing a few decorative sconces. At M&M Lighting in Houston, we’re proud to offer a stylish and affordable collection of wall sconces in our lighting showroom. Whether you’re looking for a single-light sconce to display next to your bed, a three-light sconce to install over your bathroom vanity, or a metal sconce to display in your library, you’ll love our collection of light fixtures. 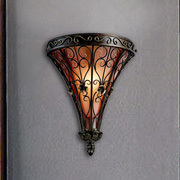 No matter what you’re looking for, we guarantee our wall sconces will help make your rooms shine! Our team of lighting consultants has been serving individuals in the Houston community for nearly 60 years. 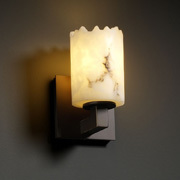 We know everything there is to know about lighting solutions and products, and we can help connect you with wall sconces that fit your style and budget. Shop our online store or visit our impressive lighting showroom in Houston today! The lighting in your home should feature three types of lighting: ambient lighting, task lighting and accent lighting. 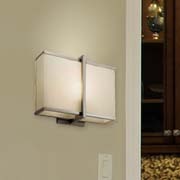 When properly utilized and positioned, wall sconces can fit into all three categories! Depending on your personal style preference and your budget, you’re bound to find something you love in our large selection of wall sconces. Finding wall sconces for your home or office might seem like a simple task, but unless you have a natural knack for design, it can prove rather difficult. Don’t worry! Our staff of lighting experts is trained to assist you in finding your ideal light fixtures. Schedule an appointment and optimize your lighting today. 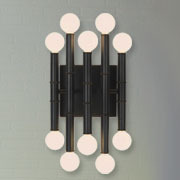 The best thing about wall sconces is their versatility. 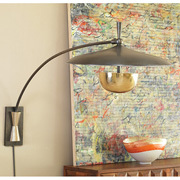 These type of light fixtures look great in every room in your home, and they’re just as effective as they are stylish. 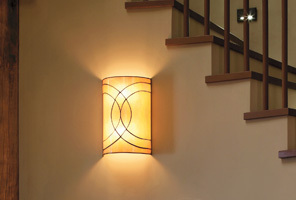 Here are some tips on how to best utilize wall sconces for each of the rooms in your home. Your home’s living room is a place where you’ll do everything from entertaining guests to relaxing on a lazy Sunday. 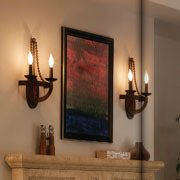 Wall sconces in this space are great for providing task lighting and ambient lighting. For example, you can install wall-mounted sconces near reading areas for additional light, or if your living room has tall ceilings, you can install sconces up high in the room for general effective lighting. Another great strategy is to install shaded wall sconces on either side of a large piece of artwork or fireplace structure. 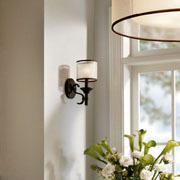 Wall sconces provide phenomenal lighting for your bathrooms. 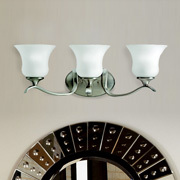 We suggest installing a wall sconce on both sides of a mirror or vanity, which gives the room a modern look. A pillar candle sconce could also add a calming sense to the room for when you need a relaxing bath at the end of a long day. You can get crafty with the wall sconces you choose to install in your bedroom. For a traditional look, install a trendy Tiffany sconce on either side of your bed. 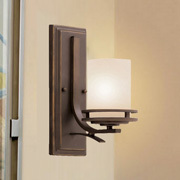 For a more modernized look, utilize metal sconces. 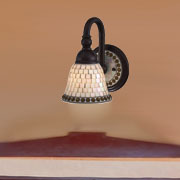 Have a room you want to include a wall sconce in that isn’t listed above? Seek help from one of our lighting specialists with any questions you might have. 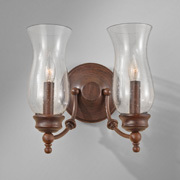 Ready to find wall sconces for your home or office? Visit our lighting showroom in Houston to see our large selection for yourself. Whether you’re starting from the ground up in your newly constructed home or you think your outdated light fixtures could use an upgrade, we can provide you with high-quality lighting products that are efficient and effective. For more information, contact our team today. You can also check out our blog for tips and advice for DIY wall lighting solutions.